An immigrant wears an ankle monitor as he sits at a shelter in McAllen, Texas after he was released after processing by U.S. Customs and Border Protection. The Trump administration faces the same challenge as its predecessors: how to ensure the tens of thousands of unauthorized immigrant families who are apprehended each year show up for their immigration hearings. Trump wants to lock more of them up. Immigrant advocates want him to expand alternatives to detention, which are already widely in use. Inside the Greyhound station in San Antonio, dozens of Central American mothers sit in the waiting room, each with a bulge under the leg of her government-issued jeans. These women entered the country illegally to request asylum, spent time in detention, and were released with a black plastic GPS device strapped onto their ankles so the government can keep track of them. A young woman who gives her first name as Mari says when she reaches her destination of Miami she plans to follow instructions and check in with the office of Immigration and Customs Enforcement, ICE. "There's so much violence in my country, that's why I fled. I'm not a criminal," she said, staring sheepishly at the blinking appliance fastened to her leg. Mari is one of more than 84,000 undocumented migrants who is enrolled in electronic monitoring—usually either an ankle bracelet or a smartphone check-in that uses voice recognition. The Obama administration, and now the Trump administration, would have preferred to detain Mari and her three kids indefinitely. But a court order forces the government to release families after three weeks in detention for the welfare of the children. Concertina wire is in vogue under this president. The administration is paying for 40,000 private contracted detention beds this year, a 3 percent increase over last year. There is a mammoth new immigrant jail under construction near Houston. And recently, the administration has proposed detaining immigrant families on military bases. "Certainly, confinement sends a very, very strong message," said Tracey Valerio, a top ICE official who oversaw the agency's budget until she left in April of this year. "But the agency has had extremely good results in terms of percentage of compliance with the alternatives to detention." All detention — especially family detention — is expensive. The government pays a private jail contractor about $320 dollars per night — as much as a five-star hotel — to detain a mother and her children in what ICE calls a family residential center. Compare that to an electronic ankle monitor at $4.12 a day. The ankle monitor program is managed by GEO Care, a non-prison subsidiary of the same mammoth corrections contractor, GEO Group, that detains thousands of immigrants for ICE. Sarah Saldaña was chief of ICE for the last two years of Obama's presidency. She thinks immigrant detention should be used more selectively. "A nursing mother waiting for months for an ultimate hearing is not a threat to public safety. A member of a drug cartel who is in the country illegally and has been apprehended by ICE is a threat to public safety," she said. Thwarted by the courts to more fully use family detention, Saldaña says when she ran the agency it was open to exploring alternatives. "We were trying to come up with something that was cost effective and somewhat based on compassion," she said. A promising idea was Family Case Management. The pilot project used case workers in five U.S. cities to help migrants navigate the immigration court system. The program cost less than $10 a day and had a 99 percent success rate with court appearances and ICE check-ins. ICE cancelled the program last year. Catholic Charities was one of the faith-based groups that administered Family Case Management. Grantees were disappointed when it was suspended. "Alternatives to detention assure compliance for people who don't work in a detention setting—people with mental health issues, trafficking or torture survivors, asylum seekers and families," said Ashley Feasley, policy director for the Migration and Refugee Services office of the U.S. Conference of Catholic Bishops. ICE declined to go on the record for this report. A spokesman for the agency said in an email that ATDs — alternatives to detention — have a 99.8 percent success rate. But here's the hitch: they are most effective at getting the participant to show up for their immigration hearings. If the migrant loses their asylum request and is ordered deported then ankle monitors are not as successful at bringing about final removal. And deportation is how ICE keeps score. Figures with the Executive Office for Immigration Review (EOIR), which runs the immigration courts, show that four out of ten non-detained immigrants do not show up for their final removal. Some are absconding, and melting into the huge undocumented, Spanish-speaking population. But there's another explanation for why there are so few deportations of immigrants on ATDs each year, versus more deportations of immigrations who are held in detention. "Those low numbers are not because people are failing to appear or cutting off their bracelets and running. Those low numbers are because those cases are not prioritized and they just linger for years and years and years," said John Sandweg, acting ICE director from 2013-2014. The Justice Department, of which EOIR is a part, has chosen to put people on ATDs at the end of the line. They're on the non-detained docket "which is so backlogged that it takes years for these cases to be heard and resolved," said Jessica Vaughan, policy director with the Center for Immigration Studies, which embraces Trump's immigration agenda and supports detention for people in the country illegally. "Whereas, if people are kept in government custody they are on a different docket that moves much more quickly," Vaughan continued, "and they can be resolved in a matter of weeks rather than years." Here's an eye-popping number: according to the latest ICE figures, there are 2,576,275 immigrants on the non-detained docket today, compared to 44,359 immigrants on the detained docket. People in detention go to the front of the line, and they're deported sooner. John Sandweg maintains that's why immigrant detention remains politically popular. "This kind of misnomer has been formed in Washington that the only way to actually enforce our immigration laws is to detain people," he says. "There's another way of doing this that is far, far cheaper, far more humane, but just as strong on the immigration enforcement component." This former ICE director has a solution: continue to use alternatives to detention, but hire more immigration judges to grind through the massive case backlog. The immigration issue has President Trump wrestling with the same challenge as past presidents - how to ensure the tens of thousands of unauthorized immigrant families who are apprehended each year show up for their immigration hearings. Trump wants to lock more of them up. Immigrant advocates want him to keep using alternatives to detention. NPR's John Burnett has more on this part of the debate. JOHN BURNETT, BYLINE: Inside the Greyhound station in San Antonio are dozens of Central American mothers with bulges on their ankles under their government-issued jeans. These women entered the country illegally, spent time in detention and were released with a black, plastic, blinking GPS device strapped onto their ankles so the government can keep track of them. BURNETT: Mari says she fled to the U.S. to escape gang violence in Guatemala. When she reaches her destination of Miami, she says she plans to follow orders and check in with the Office of Immigration and Customs Enforcement, or ICE. Mari is one of about 84,000 undocumented migrants who's on electronic monitoring - usually either an ankle bracelet or a smartphone check-in that uses voice recognition. The Obama administration and now Trump would have preferred to detain Mari and her three kids indefinitely. BURNETT: But a court order forces the government to release families after three weeks in detention for the welfare of the children. Concertina wire is in vogue under this president. The administration is paying for 40,000 private contracted detention beds this year - a 3 percent increase over last year. There's a mammoth new immigrant jail under construction near Houston. And recently, the administration has proposed detaining thousands of immigrant families on military bases. TRACEY VALERIO: Certainly confinement sends a very, very strong message. BURNETT: Tracey Valerio was a top ICE official until April of this year, overseeing the agency's budget. VALERIO: But the agency has had extremely good results in terms of percentage of compliance with the alternatives to detention. BURNETT: All detention, especially family detention, is expensive. The government pays a private jail contractor about $320 per night - as much as a five-star hotel - to detain a mother and her children in what ICE calls a family residential center. Compare that to an electronic ankle monitor at $4.12 a day. Sarah Saldana was chief of ICE for the last two years of Obama's presidency. She thinks expensive immigrant detention should be used more selectively. SARAH SALDANA: A nursing mother waiting for months for a ultimate hearing is not a threat to public safety. A member of a drug cartel who has been in the country illegally and has been apprehended by ICE is a threat to public safety. BURNETT: ICE declined to go on record for this report. A spokesman said in an email that ATDs - alternatives to detention - have a 99.8 percent success rate, but this is key. They're most effective at getting the participant to their immigration hearings. 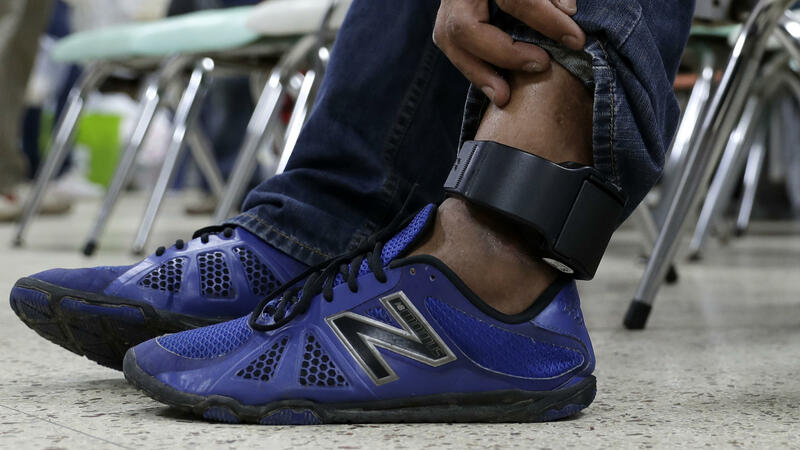 If the migrant loses their asylum request and is ordered deported, then ankle monitors are not as successful at bringing about final removal. And deportation is how ICE keeps score. Figures with the Executive Office for Immigration Review, which runs the immigration courts, show that 4 out of 10 non-detained immigrants do not show up for their final removal. Some are absconding. But there's another explanation for why there are so few deportations of immigrants on ATDs each year versus more deportations of detained immigrants. JOHN SANDWEG: Those little numbers are not because people are failing to appear or cutting off their bracelets and running. Those little numbers are because those cases are not prioritized, and they just linger on the docket for years and years and years. BURNETT: John Sandweg was acting director of Immigration and Customs Enforcement during 2013 and 2014. BURNETT: As he explains it, the Justice Department, which is over the immigration courts, has chosen to put people on ATDs at the end of the line. They're on what's called the non-detain docket. JESSICA VAUGHAN: Which is so backlogged that it takes years for these cases to be heard and resolved. BURNETT: Jessica Vaughan is policy director with the Center for Immigration Studies, which embraces Trump's immigration agenda and supports more detention for people in the country illegally. VAUGHAN: Whereas if people are kept in government custody, they are on a different docket that moves much more quickly. And they can be resolved in a matter of weeks rather than years. BURNETT: Here's an eye-popping number. Today there are more than 2 1/2 million immigrants on the non-detain docket compared to just over 44,000 immigrants on the detain docket. Immigrants in detention go to the front of the line, and they're deported sooner. John Sandweg says that's why detention remains politically popular. SANDWEG: And so this kind of misnomer has been formed in Washington that the only way to actually enforce our immigration laws is to detain people. BURNETT: This former ICE director has a solution - continue to use alternatives to detention but hire more immigration judges to grind through the massive case backlog. John Burnett, NPR News, Austin.